Molinello, a charming 18th Century stone farmhouse, enclosed by its acre of garden, is situated in a very lovely, sparsely populated rural valley, 20 minutes drive from Perugia (the capital city of Umbria) and within easy driving distance of many of the other most remarkable towns of Umbria and Tuscany. A careful restoration has kept the character of the house intact whilst transforming it into a comfortable and much loved Italian home. We fell in love with Umbria on our first visit in the 1980's. In the early 1990's we started a family and shortly afterwards bought Molinello, then a ruined property, and set about renovating it. Since that time we have enjoyed many family holidays at the house and now that our children are adults they take their friends there too for holidays. We have explored the area extensively and never tire of it. As lovers of good food we enjoy shopping for local specialities, searching out good wines and restaurants. When not in Umbria we live in Yorkshire. Sitting room with TV and DVD player ipod player, 2 sofas and armchairs. Shaded terrace accessible from the kitchen with table for dining. There is a golf course at Antagnolla which is a 15 minute drive from the house. The pool is for the exclusive use of Molinello guests it is approx 12m x 6m with steps into the shallow end. Notes on accommodation: The accommodation is suitable for a maximum of 7 guests. The bedrooms, bathrooms and utility room are on the lower floor ensuring that they are cool in the heat of summer and the kitchen/dining room and sitting room are located on the upper floor. There is a large covered raised terrace running the length of the property which is ideal for dining out. No pets allowed. Outside: Large garden which contains the swimming pool and boule pitch, and is equipped with furniture and barbecue. The garden is designed for a family who choose, when possible, to live out-of-doors, with many areas that are safe and exciting to play in, as well as sheltered and secluded areas for dining and relaxing. The feeling of the garden is of unusual luxuriance; the shade provided by its trees, hedges and shrubs providing a dramatic contrast to the large, open, cut green and gravel areas. It is maintained throughout the year and is approximately of 1 acre, on a level, bordered by 2 streams which run dry in the hottest months. The rest of the year the sound of running water is a feature of the garden. There are many fine mature trees, including linden, cypress and false acacia. The pool is open June to September. Utility Room: Utility room with washing machine. Cleaning / Towels / Linen / Maid service: The house will be thoroughly cleaned before the arrival of guests and we request that it is left reasonably clean and tidy when they leave. Bathroom and pool towels provided Other: There are entrances into the kitchen from a large roofed verandah which provides an outside dining area (west facing) and a small balcony (east facing). This is a pretty house, with pleasant garden and superb swimming pool. It is surrounded by a sheep farm, which provides much amusement and the tinkling of the sheep bells which is not loud and which we found charming. Inside, the kitchen and siting room are large and comfortable. The kitchen equipment is first rate, as the owners are clearly serious cooks, and far above the common miserable standard of so many rentals in Europe. The bedrooms being downstairs keep cool, even in July. Five stars are only missed because the lighting in the sitting room hardly permits reading and there was a drain fault in one bathroom which caused minor flooding of the floor by the bathwater (but this could be controlled with care). We had a lovely peaceful holiday there. Perfect for a family reunion and prolonged birthday party. The bedrooms are on the lower floor, which makes them cooler. Kitchen is better equipped than many rental properties we have stayed in, making it easy to cook. The swimming pool is perfect, with lovely views of the surrounding hills. Watching the fireflies dancing around the garden in the evening was magical. It is a 20 minute drive from anywhere, so you need to be well-organised. However, Perugia, Assisi, Gubbio and Lago di Trasimeno are all within an hour of the property, so there are lots of possible excursions. Un très agréable lieu plein de charme, au milieu des collines et des animaux de la ferme voisine. Notre secours de 3 jours fût d'une tranquillité formidable à quelques pas de la très belle ville de Perugia. The villa is off the beaten- track and surrounded by a working farm. Despite it's rural location trips to Assisi, Perugia and Gubbio were all within an easy 30 minute drive. Shops, bakeries and other everyday necessities were 10 to 15 minute drive. The layout of villa meant that bedrooms remained cool even on hottest days. The pool and garden were a great addition. Everything in the villa was exceptionally well maintained. Rae (owner) was always available to answer any queries and to provide helpful local information. We had a very quiet rest, among the multiple plus of the house, I can notice : the large and beautiful pool in the middle of the well-maintained garden, spacious rooms, DVD player and Internet access, a "pétanque" strip. The place is a good start for hiking in the countryside, admiring dramatic views from the top of the hills, bumping animals and birds. 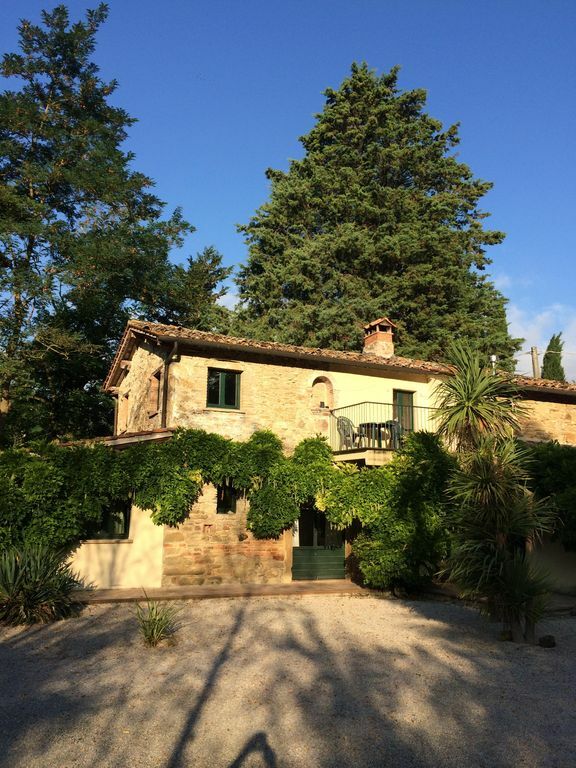 We were recommended this property by friends and it was the perfect holiday home from which to explore the local Umbrian countryside and towns and then provide us with rural peace, cool and shade from the August heat. The house is spacious and cool, was clean, well-maintained and has ample facilities. The pool was a perfect temperature. Rae provided us with plenty of helpful information and directions. We would definitely recommend this property. A car is essential. Hire cars can be collected at all the airports mentioned above and advice re. companies is given on request. Whilst this hillside region is noted for its beautiful landscape and Lago Trasimeno, the largest lake in Central Italy, with ferry boats to the 2 major islands is less than 15 miles. Florence and Rome are easily accessed by car, but for relaxed day trips the train service, which is efficient and inexpensive, is recommended. The elegant pool, 12m x 5m has large shallow curved steps at 1 end. The surrounding of the pool is paved with terracotta tiles which lead to the canopied shade of a large walnut tree (a favourite dining place). This tree also provides shade for spectators of boule matches and is, therefore pivotal to both areas otherwise separated and enclosed by hedges. Molinello is situated low down in the valley. The white road that winds through the valley to it is well maintained. Beyond the garden, the land gently rises in all directions, allowing wide views of the landscape. The surrounding land is owned by sheep farmers, whose farmhouse is 1km away. The lower slopes of the hills are pasture land interspersed with areas of natural woodland, primarily of oak and juniper. The mountain of Montacuto (which was 1 of the most important Etruscan sites in the area) is visible from the house. This is excellent walking country when it is not too hot and there is much to interest wild flower and funghi enthusiasts. There are many good, inexpensive local restaurants, some of which are in, or close to, the small nearby town of Umbertide (which is also a good place to shop, especially on market days when there is a great range of local produce available). Other well recommended places to eat can be found in nearby villages, and some in spectacular scenic locations in the hills. There are good tennis courts in the area. Booking Notes: For rentals of more than 1 week there will be a change of bed linen, bathroom and kichen towels. If cleaning is required it will be charged additionally. Changeover Day: The changeover day is usually Friday or Saturday during the main season but may be negotiable. Notes on prices: Prices for the property per week are in UK pounds. Prices do not include central heating. Discounts are available for rental periods of 3 weeks or more.